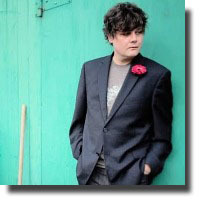 Legendary Canadian tunesmith Ron Sexsmith walked out on the stage carrying two coffee mugs. With his signature mop of hair hanging into one eye, he gave a quick wave to the audience, before he and his band launched into their opening song, Thinking Out Loud. In the sold out Kay Meek Theatre, it was apparent that these lyrics were well known to his appreciative audience. His next song Late Bloomer was off his latest CD Late Bloomer, which might humorously, but accurately, describe his seventeen-year flirtation with musical fame as he has continued to sing songs about love and longing. Sexsmith made the audience laugh over his description of himself as Shrek 3 in the 2010 documentary about his singing career, Love Shines. He seemed mostly interested in keeping the show rolling along from song to song, so much so that he sometimes had to stop and wipe his face with a towel. For one song, he took the time to sincerely dedicate it to his wife Jean, whom he indicated was outside in the lobby working at the merchandise table. A few of the most memorable songs for me were Destination Unknown and Secret Heart, because these both were sung so clearly by Sexsmith and were not overpowered by the instruments. Sexsmith went onto the piano at one point and gave a stellar rendition of There’s a Rhythm from his 1995 debut album. At the end of the concert, the audience gave a standing ovation for Sexsmith and his band, but I felt that it was like a moment at the end of a good meal when the waiter tries to tempt you with dessert. Although the band came back for three more songs, it wasn’t necessary because we had already had the full course.